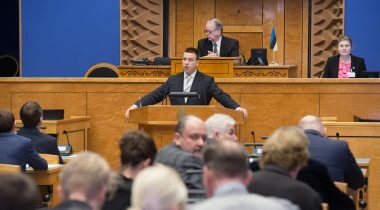 At today’s sitting, when giving an overview of the situation in research and development activities and the Government’s policy in this sphere, Prime Minister Jüri Ratas stressed that cooperation between researchers and undertakings needs to be improved, and the impact of science on economic development must increase. 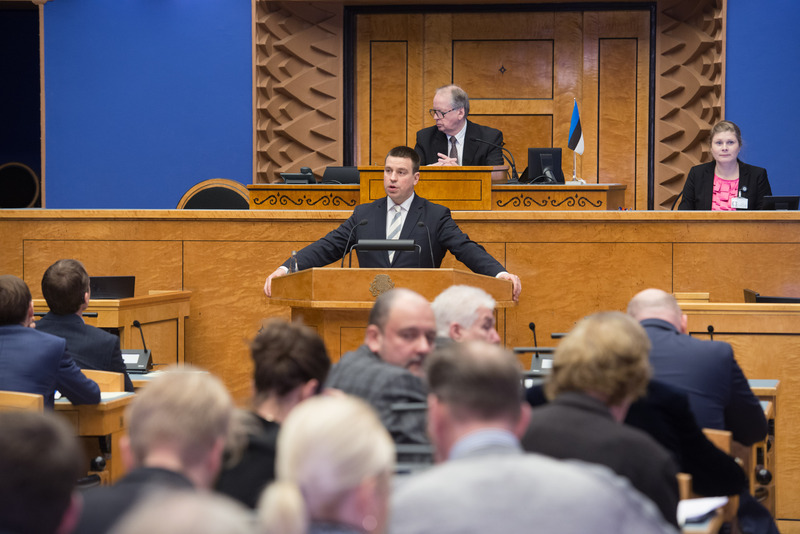 Prime Minister Ratas said that achieving better cooperation between universities and other research institutions and undertakings has been a central issue in the Estonian research and development sector through the years. “For the current Government coalition, too, it is a priority sector that needs clear progress. A precondition for the development of the Estonian economy is a knowledge-intensive business sector – more complex products and services help compete better, and create greater added value and jobs,” Ratas said. He added that the proportion of research and development conducted in cooperation with the private sector must increase. He pointed out as an example that studies commissioned and funded by enterprises account for less than five per cent of the research spending of research and development institutions. In Ratas’s opinion, stability of funding and clearly agreed objectives are the basis for effective research cooperation. “We have decided to increase the proportion of the basic funding of research to 50 per cent. At the moment, the ratio of basic funding to project-based funding is circa 30 and 70 per cent. In addition, we will allocate additional 9 million euro for scholarships for doctoral students starting from 2018,” Ratas noted. Ratas said that Estonia aims to achieve the target of three per cent of GDP for research and development by 2020. He stated that at the moment we are far from this target because the proportion of research and development spending had accounted for 1.5 per cent of GDP in 2015. “The coalition is aiming to raise the proportion of research and development spending incurred by the state to one per cent of GDP. The growth of state spending will contribute to the stimulation of private sector investments if the state uses its funds smartly,” Ratas said. In Ratas’s opinion, this is a good time to make fundamental strategic changes to the management and funding of the Estonian research and development and innovation system. He said that the task force for long-term funding and management of research and higher education will present its proposals on this issue to the Government in the third quarter of this year. Ratas mentioned as a central problem that managers and owners of enterprises are little aware of the possibilities of using information and communication technology, and have limited motivation to make technology investments. In the exploitation of digital solutions, Estonia ranks as low as 22nd among the 28 European Union countries. “It is necessary to create cooperation platforms proceeding from the needs and interests of enterprises that contribute to the digitalisation of small and medium sized enterprises,” Ratas said. In her speech, Barbi Pilvre, who took the floor on behalf of the Social Democratic Party Faction in the debate, discussed the communication between the world of research and the society. Jürgen Ligi, who took the floor on behalf of the Reform Party Faction, said that he had liked the highlighting of the research achievements of Estonia and the stressing of the consistency of education in Prime Minister’s speech. In his opinion, the speech had lacked a general vision of the meaning of research in the society and a method of how to change the structure of the economy. Mart Helme, who took the floor on behalf of the Conservative People’s Party Faction, said that application of research is the key issue for the Estonian economy to become competitive. In his opinion, applied sciences should be an independent export-capable development branch. In the opinion of Aadu Must, who took the floor on behalf of the Centre Party Faction, the Prime Minister’s report had clearly brought out that the Government does not engage in research work but creates conditions for the functioning of education and research and development in the society. He mentioned the problems in the cooperation between universities. In her speech, Viktoria Ladõnskaja from the Pro Patria and Res Publica Union Faction pointed out tendencies in education and research, for example the limited human resources and financial resources. She considered it important to raise the scholarships for doctoral students. Krista Aru, who took the floor on behalf of the Free Party Faction, noted that she would have expected to hear more about the new Government’s policy in the research and development from the Prime Minister’s speech. The issues concerning higher education and the consolidation of research institutions had also raised questions. In Aru’s opinion, the Estonian society and the Estonian scientific research have grown apart. The aim of the Bill on Amendments to the Health Insurance Act (315 SE), initiated by the Free Party Faction, is to exempt disabled people of up to 19 years of age from the obligation to pay a visit fee for out-patient specialised medical care. For that, the Bill provides for a change to the procedure for the payment of visit fees for out-patient specialised medical care. Monika Haukanõmm, who presented the Bill, said that the proposal was to exempt disabled children from visit fees because they need health services to a greater extent as compared to ordinary children. The Bill on Amendments to the Riigikogu Rules of Procedure and Internal Rules Act and the Code of Criminal Procedure which strengthens parliamentary scrutiny (313 SE), initiated by the Free Party Faction, provides for measures to enhance the activities of the committees of investigation of the Riigikogu. The aim of the Bill is to ensure that persons appear before the committee, and that documents and information are forwarded at the request of the committee. Artur Talvik, who presented the Bill, said that the Bill aims to strengthen parliamentary scrutiny and the power of the committees of investigation of the Riigikogu. In his opinion, at the moment, committees of investigation have no mechanism to obligate persons who are to give testimony to show up. The Bill is intended to give committees of investigation the right to issue precepts according to the Substitutive Enforcement and Penalty Payment Act, and to impose a penalty payment of up to 8000 euro for attainment of the legitimate objective as long as this is necessary. The Bill will also establish the basis for application of compelled attendance with regard to persons who have repeatedly ignored a summons from a committee of investigation without good reason and who are substantially connected to the investigation carried out by the committee. Due to the end of the working hours of the Riigikogu, the proceedings on the Bill will be resumed at Wednesday’s sitting.